When you think about retirement planning, what comes to mind? Money? While that’s a legitimate concern, most people skip over the all-important first step. It has nothing to do with money and overlooking it could mean you’re not adequately preparing for your future. That first step is just one of five that will help get you on the right track. Step 1: What do I want my life to look like in retirement? Everything revolves around this simple question, but for most, answering it is the most difficult part of the process. Shockingly, many have never thought about it or talked about it. A lot of times, a husband and wife talk and realize they don’t know what the other person wants. You’ve got to spend time thinking about this so you can build a plan based on your wants and needs. Step 2: What am I doing to reach my goals? Estate planning – ensure that you have the lowest estate tax liability possible. Income – is my work stable? How is my income going to evolve? Investments – what kinds of risks do I need to take to meet my goals? Taxes – do whatever is necessary to pay the least amount. Life insurance – what type is best for you and your family’s needs and how long do you need it? Even the best financial plan isn’t going to work if you don’t factor in life insurance. When you lay out your plan, you may see the result and think, I’m going to be alright. Or, that’s way less money than I thought. These reactions are why you want to evaluate all available options. Thoroughly examine every opportunity and only consider ones that are going to be most effective for attaining your goals. You should also review and analyze your Social Security. You need to understand the appropriate time to draw the money and how it’s going to affect your plan. Too often we find people are taking Social Security early, which isn’t necessarily the best strategy. The next step is to compile all your data to create reports for your long-term cash flow, current and future expenses, liabilities, etc. This will allow you to see where certain aspects of your plan may not work out the way you thought they would, or they may not be doable. You will review areas such as investments and savings to see what’s been done and what could or should be done to keep your plan on track. If you’ve done the first four steps and you don’t do number five, your life is going to change. 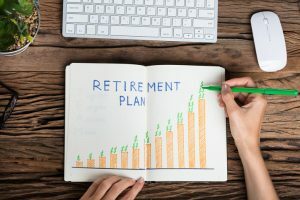 No illustration or report can accurately forecast how real-world circumstances will affect your financial situation and ultimately your retirement plan. You must continually review it to see if you’re on target long-term.